Custom Wood Vent Hood - I&E Cabinets Ships! 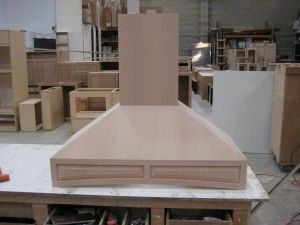 Your Custom Wood Vent Hood box for your stove will be perfect. I&E Cabinets makes it to your exact specifications. We do any size and any wood type. We ship anywhere in the US, too. 1. Is the custom wood vent hood for an island or against a wall? 2. Are you going ductless or will there be a vent going outside? 3. How wide do you want it? The same size as your stove, smaller, or larger? 4. What does your stove manufacturer recommend as the sweet spot for your ventilation? In other words, how high and how low could you have the custom wood vent hood and it still perform the best? 5. With a decision on duct or ductless and knowing the width and height you desire, you will be ready to look into what kind of fan and liner you want. Remember to think about lighting when you are picking out your liner. And don't forget to leave room for your tile backsplash if it is going to go behind the custom wood vent hood. Some tile is pretty thick! 6. Call us. Tell us how wide and high you want you stove hood cover to be and the dimensions of the liner. The only place where the liner insert and the outside cover must meet and fit is at the bottom edge of the metal liner insert. In both width and depth the height of a liner insert can be much shorter than the height of the decorative hood. 7. We can discuss what kind of look you want. Tell us which style you like. There are so many styles. Chimney, curved, and custom wood vent hoods with mantles. Do you really want a custom wood vent hood? Do you have drawings? We'd love to make them come to life! Learn more about our Cabinets.